Perfect location, amazing shower, really nice staff and very clean room. Great location (right on the trail to Oia) and value for the money. The daily cleaning was great and the staff was very kind and helpful. The airport shuttle was also a great bonus! Great host and the airport transfers were a bonus. Stayed in the triple room and had sea views from the small balcony to both sides of the island. AC worked great and the fridge kept everything cold. Beds were firmer than I'm use to but this is the norm in most places we stayed in Europe. Location was convenient as well. The room is basic but all you need. The staff was so welcoming, nice, and accommodating to our odd checkin and our hours. The location was right on the path to great restaurants in Fira or the hike to Oia. And with the bus stop right out front, it made getting around the entire island easy and affordable! I think the location is perfect, because it's not in the centre of the busy tourist area. It's close to a great viewpoint of the caldera, and you can easily walk down along the edge to Fira. 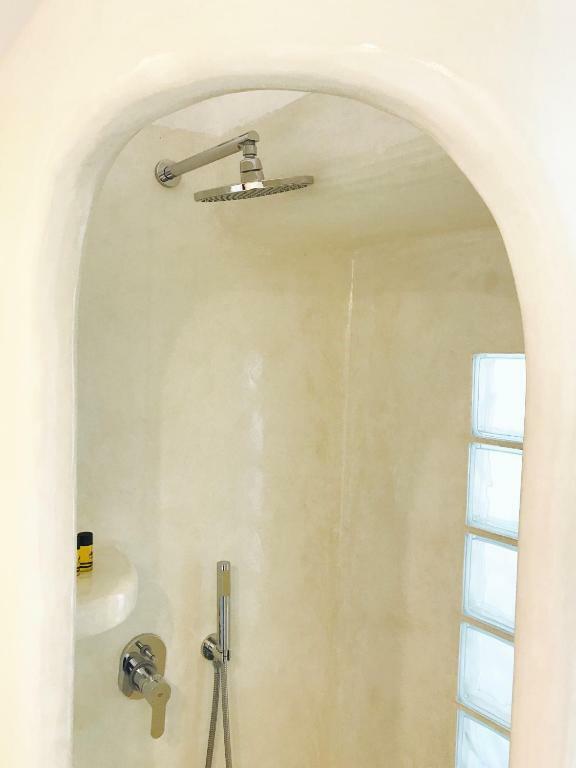 In terms of the room, I really liked the smooth wall design of the bathroom. Our room had a nice balcony that we could see the east coast from. The manager was extremely nice and helpful, by recommending a boat trip and providing free transfer to the airport. Lovely little hotel in excellent central location. 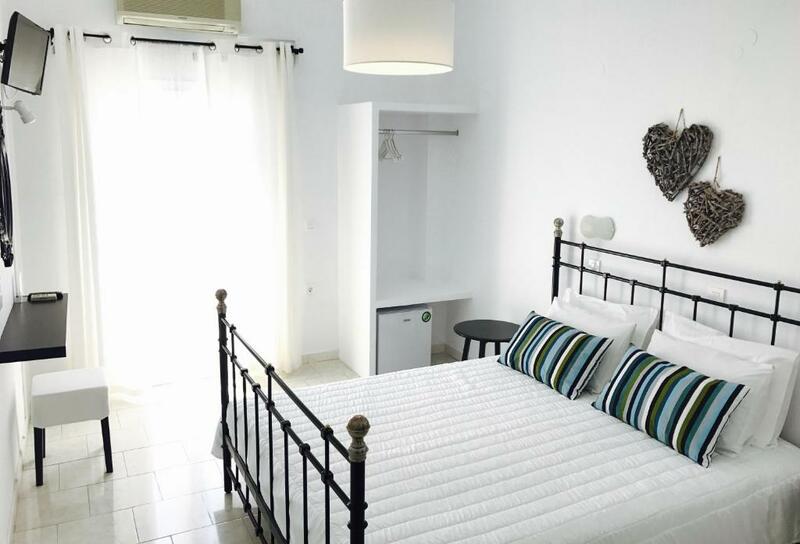 Rooms in immaculate condition. Meters away from the bus stop to Thira and Oia and right by a beautiful viewing spot of the Caldera. We also got an unexpected free airport shuttle when we left! Very friendly and helpful staff. Highly recommended. Lock in a great price for Villa Fotini – rated 9.2 by recent guests! One of our best sellers in Firostefani! 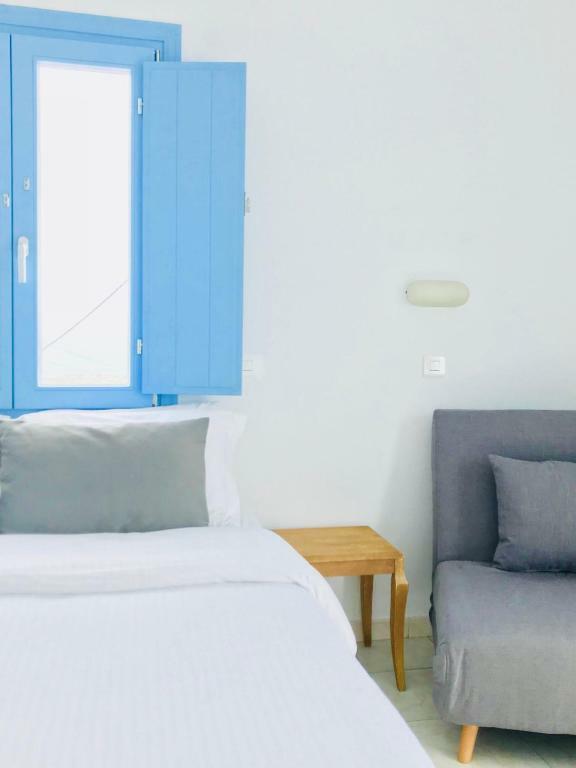 Located in Firostefani, between famous Fira and scenic Imerovigli, this traditional pension is just 50 feet from Santorini’s famous sunset spot. Busses to Oia stop right across from the property. Villa Fotini features air-conditioned rooms with private balconies. All guest rooms are equipped with TV, refrigerator, and private bathroom. Free Wi-Fi is available throughout. Spectacular Caldera and sunset views are also possible from just outside the hotel. Villa Fotini is 6.2 mi away from Oia and a 10-minute drive to Santorini Airport. When would you like to stay at Villa Fotini? 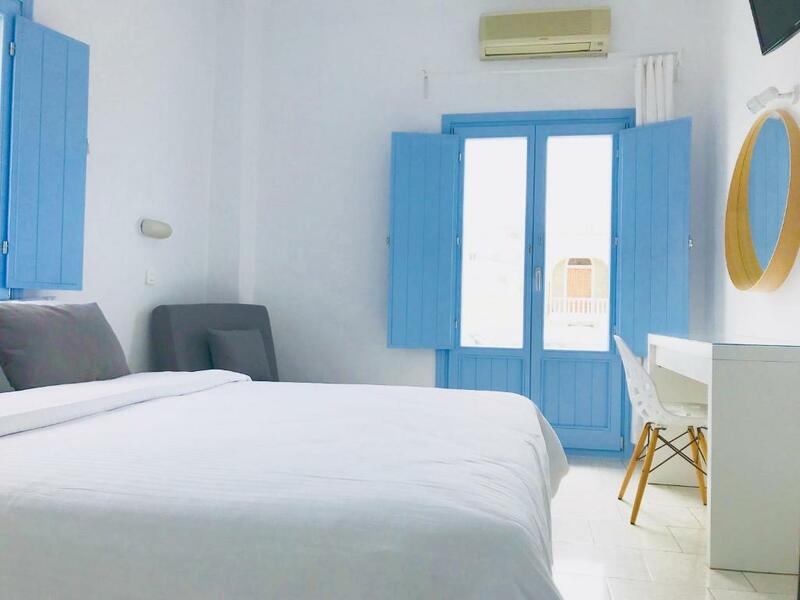 Bright room with cool tiled floors, TV and air conditioning. It also includes a fridge, private bathroom and balcony. Spacious apartment with a TV and a kitchenette with dining area. In Villa Fotini you can find family enviroment , Maria is always on front desk. The location is perfect , near to town and next of the famous view. 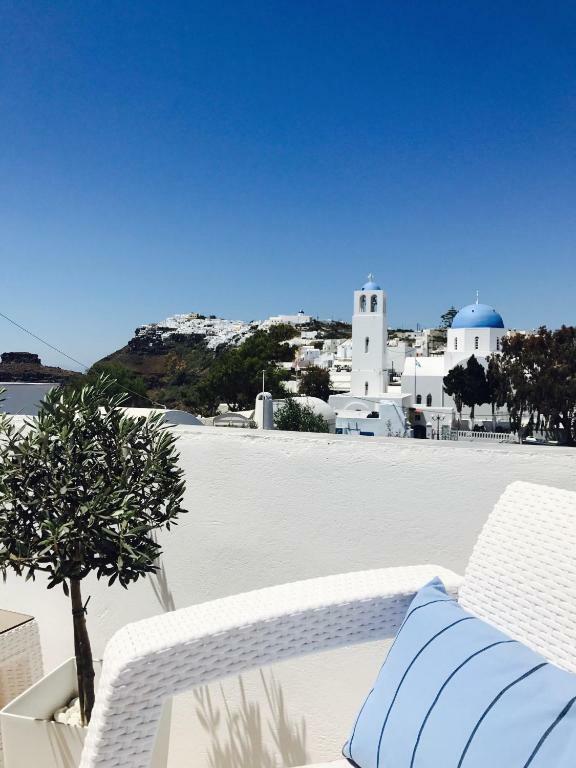 Our villa located on the highest position of FIROSTEFANI , near to the famous blue dome and opposite of the bus stop to Oia. You can go by walk to Fira using the path of Caldera where you can find many restaurants and cafe. House Rules Villa Fotini takes special requests – add in the next step! Villa Fotini accepts these cards and reserves the right to temporarily hold an amount prior to arrival. Please inform Villa Fotini of your expected arrival time in advance. You can use the Special Requests box when booking, or contact the property directly using the contact details in your confirmation. The air conditioner and a fridge were very loud, so better take ear plugs if you have troubles with sleep :) Also one night was very rainy and windy and because of that, in the room was really loud as well. We had a really good stay at Villa Fotini, in a nice, traditional style room. The room was equipped in everything you need including a small fridge, and also has been cleaned everyday. There was no problem with late check-in and early check-out and organizing a taxi from and to the airport. The shower could have had a shower curtain to prevent water from going everywhere. Maria was absolutely lovely and helped with every query I had. The villa was always sparkling clean and housekeeping tidied every day! 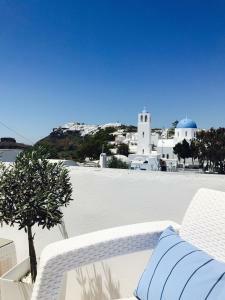 The location was excellent, a short walk from Fira and right opposite the bus stop to Oia. For a budget hotel, it really exceeded my expectations. Great service. Host really helpful. Very nice. It is close to Fira which takes only 15minutes walking. Perfect choice for us as we needed a hotel for the first night of our trip after arriving quite late in the evening. The owners met us at the airport, despite the plane being delayed, and drove us to the hotel in Firostefani. Seamless check-in and our room was very pleasant - being on the second floor with a balcony. We were given good recommendations for nearby shops and late night food. Slept very well, and had time in the morning to walk to Fira for a nice late breakfast and shopping, before heading back to check out by 12. We were then reasonably close to the bus station to get to Oia which is where we were spending the main part of our trip. For this price/quality ratio on Santorini nothing can be more good. If you want be like a queen/king, you must pay four-six times more. But maybe then you will not be able to feel the connection with the people living on the island. I think that the people who manage this hotel are a good example of the inhabitants of the island. There are other examples, of course. All was good. Really good value for money. Maria (manager of the hotel) is a nice person, if you have any questions - contact her, she will try to help from the heart. I thought that for this price there would be no view of the island at all, however there was a balcony and from it I was able to observe the sunrise and the eastern part of the island. But I think its depends on what type of room you will have, please, ask the host prior to arrival. Very clean room, good pressure in the shower (hot water, there was no interruption). The location is perfect - between Thira and Imerovigli, you can walk to any town in 15-25 minutes. I think if you are going to Santorini, then you are ready for the fact that from time to time you have to overcome steepy inclines, climbs and stairs. I think that October is an ideal month for hiking around the island, as it is still quite warm (sometimes even hot during the day)... but not so hot as in the crater of a volcano (like in July/August) and walks are not so tiring. However, if you want to swim, as for me the water is also very comfortable, refreshing (was on Kamari Beach at the end of October, its okay). But prepare yourself for a little bit cold evenings and nights (warm clothes needed). I arrived late at Santorini (8:30pm)and probably need self check in as their service is until 9pm. But the host Maria just wait for me (and another group of people arrived at the same time) in the hotel. The hotel also provided free airport shuttle. Really appreciate. Noice from neighbours rooms and refrigerator noise was too much at night. Less space in the room. Everything else. great location, love the sea views. Room was very comfortable, recommend to every one. Staff sometimes weren't available during their posted "office hours", creating some frustration. Adequate... no frills but very reasonably priced considering the high cost of Santorini. The location of the Villa was perfect for us! Maria was very kind and helpful! I definitely recommend this place. Spotless, cute little balcony for fresh air. Great location.